OK, so I got crap in my last blaster but this made up for it tenfold. Although I did not get a chrome or refractor, I am not disappointed. I decided to rip the packs tonight out of boredom and curiosity. The first pack made me happy despite the fact that I don't care for what it was. I pulled a Cameron Maybin game used bat card, and a Placido Polanco SP. We are going to fast forward to pack 5, and then I will show you the other inserts. Pack 5 caught me way off guard. I saw the top of it and was like whoa there, then actually read it. 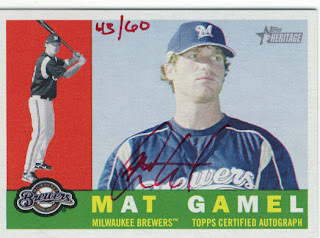 I pulled a Real One Autograph hand numbered 43/60 and all red ink of Mat Gamel. Sick pull for a blaster considering some hobby boxes don't even contain an autograph. 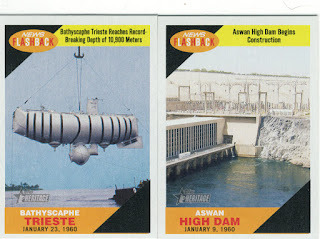 Somewhere in the packs I pulled a Marcus Thames SP, along with the inserts pictured below. Pack 7 also contained 9 cards instead of 8, which oddly enough while holding the contents of that pack I thought felt a wee bit heavier. So far since the blasters have been around I have opened 4, this is the only one that had a game used card much less an autograph. I think I am going to quit buying these after this one because it's not going to get any better as far as odds. In 4 blasters I did not see an Albert Pujols or Derek Jeter, not that I expect to see them ever but it's a pleasant surprise sometimes to get them. The autograph is sweet, however I don't care for Mat Gamel and will end up trying to trade it or sell it. One completed listing for a red ink auto makes this look promising if I decide to sell it. 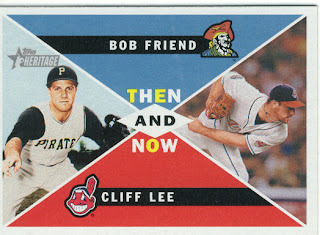 I'm not sure how many base cards I needed out of this, but I didn't really intend on trying to complete the set. I have a ton of doubles available from previous blasters, and I'm sure more from this one. If anyone needs any let me know we can work out a trade for something. - Need some quick cash, to pick up a few more cards for your collection, but your wallet's tight? Don't worry about a thing, hop online and check out a vast array of resources available to you. Check out a cash advance, and get stunning pieces today! Wow, that's a sweet pull. I've bought 6 or 7 blasters plus probably half a box of single packs and only pulled two GU jersey cards. just like greg, i've bought a bunch of blasters so far, and all i've got to show for it is a bunch of chrome and refractor cards. Wow that's awesome - congrats! Yeah, the last blaster I opened I didn't even get a chrome or a refractor. I think I'm done, lol. I'm waiting on the cards I wanted from some bloggers, and if anyone has seen a Pujols refractor in their boxes plmk. 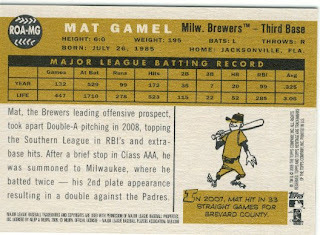 Post that Gamel on the Beckett boards, and you'll get swarmed with trade requests. Holy smokes! Autos are 1:70 blasters so that's an amazing pull PLUS a GU!! That's def. blaster of the year. Makes my GU,chrome,refractor,Chipper All Star short print blaster look like crap. I'm up for a trade as I still need quite a few to finish the set. 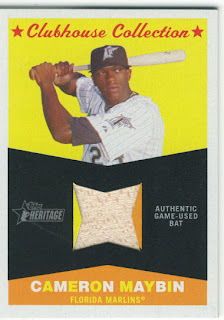 Sounds like Heritage blasters are better buy than the hobby edition. 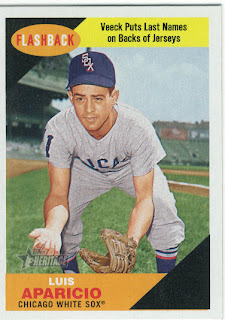 I notice that few years ago when I got game-used Stan Musial bat from a blaster box. What did I get from Heritage box? Paul Konerko game-used bat. Now think about it.